Local Initiatives Support Corporation (LISC) was interested in revisiting the role it might play regarding Anchor Institutions’ involvement in community development programs. If it is determined that LISC partnerships with Anchor Institutions are achievable and can be beneficial for communities in which they work, recommendations will be made to help pursue these partnerships. The goal of these alliances is to develop, implement, or enhance programs to achieve urban revitalization. Anchor Institutions are large organizations that tend to be place-based and deeply rooted in their local geographies. They hold significant investments in real estate and social capital, making it difficult and unlikely that they will move. Examples of Anchor Institutions in the for-profit sector include financial institutions, media and utility companies, large corporations, and sports franchises. Other potential Anchor Institutions include cultural institutions (such as museums, libraries, performing arts facilities), religious institutions, and military installations. While all Anchor Institutions have the potential to be key engines of growth and revitalization in their communities, it is Colleges and Universities and Medical Institutions (so called Eds and Meds) that are increasingly playing a major role as Anchor Institutions, and it is the Eds and Meds that are the focus of this report. 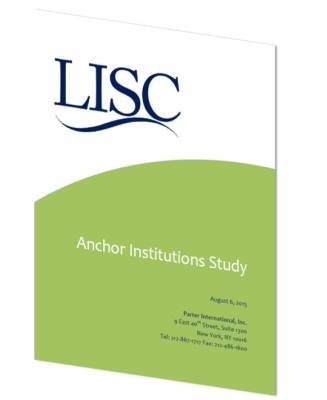 The objective of this report was to understand the potential of partnering with Anchor Institutions by reviewing best practices; surveying what LISC is currently doing in partnership with Anchor Institutions; determining what models exist that are applicable for expansion or replication within LISC’s local network; and if appropriate designing a framework for developing a LISC/Anchor Institutions program that can be to presented to prospective funders.